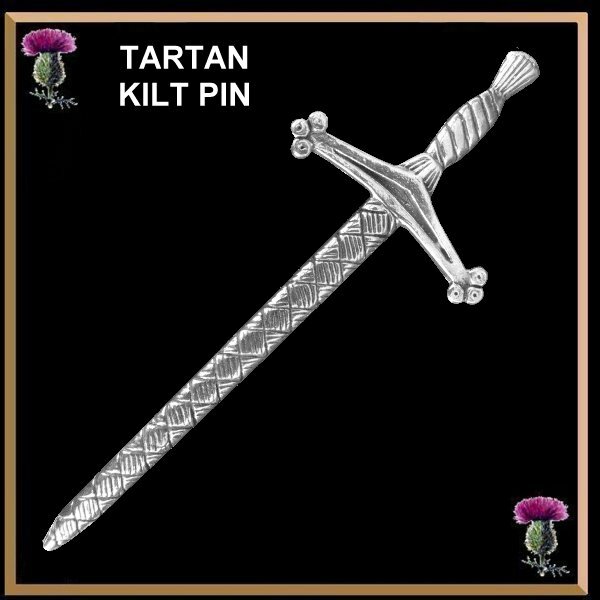 Do you know the real story of Scotland's kilt pin? Before the reign of Queen, the Scottish kilt was worn without the pin now used to secure the fold	over on the right hand side. As a result there were many embarrassing moments especially if you wore the kilt in a high wind. The truth was that nothing in the nature of undergarments was worn with the kilt. One day Queen Victoria arrived on a visit to Balmoral Castle and reviewed the Gordon	Highlanders. A stiff wind was blowing and one young soldier at rigid attention was unable to control the flapping of his kilt and to avoid exposure on this important occasion. The Queen notice his embarrassment and walked over to him. She removed a pin from her own dress and leaning over, pinned the overlap of his kilt. 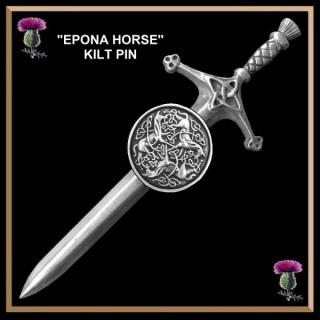 And that - believe it or not - is the origin of the kilt pin, without which no kilted Scot would be properly dressed today. 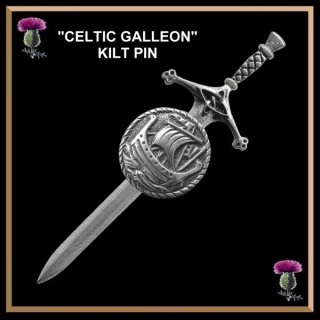 The kilt pin is not pinned through both the outer flap and the inner kilt. It is pinned just to the outer flap of the kilt and acts as a weight. This saves the pin from breaking trying to hold the two materials together. 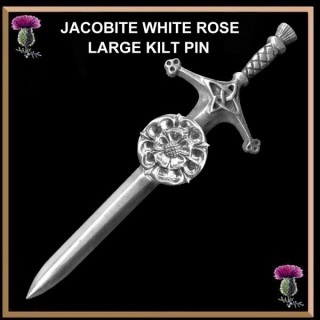 If you have a highly treasured kilt pin and do not want to lose it you can sew the hilt on the kilt pin to the flap. 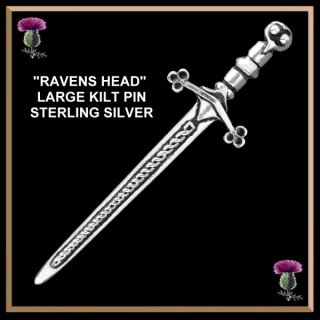 Solid sterling silver "Ravens head" kilt pin. Solid sterling silver "Tartan" kilt pin. 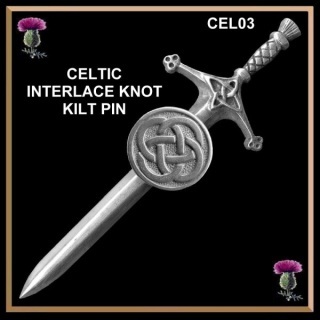 This kilt pin has a "tartan" pattern down the length of the sword. The hilt or handle has a thistle pattern Very unique! 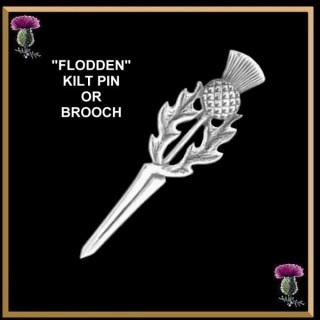 This is our very popular large pewter kilt pin with a Scottish thistle top design. The overall length is 3-7/8” and is 1-5/16” (99mm x 33mm) across the handle of the sword with a secure high quality pin back. Decorative and functional, kilt pins are not only for securing the flap of your kilt but can also be worn on a scarf or a lapel of a jacket. Solid sterling silver plain kilt pin typically used by Scottish regiments. This beautiful raised relief high quality lead free pewter design is available in a full match set of items. Great for a wedding for the groomsman or bridesmaids. An excellent matching set! The four sections of this design each create a Celtic heart shape. The universal symbol of love. In addition, the Celtic interlace design is divided into four quadrants. The directions of the compass representing the world and also representing the four elements earth, air, fire and water. The circular design is also a female symbol of fertility. (Representing the womb). The overall interlace is the symbol of everlasting life or love. A nice connection for lovers or newly weds. This beautiful raised relief sterling silver design features 'Epona' from the Gaulish word for "horse", epos. Her name means "Divine Mare". Horses were important to the Celts and were used for warfare, transportation, plowing, and traveling. Although she is most frequently portrayed as a goddess who protects horses and riders, there is evidence that in her original form among the Gauls, she was a Goddess of fertility and abundance, in essence a very typical Mother Goddess. This zoomorphic disk measures 13/16" (22mm) and made in our studio from the finest sterling silver and mounted on a pewter kilt pin. The overall length is 3-7/8” and is 1-5/16” (99mm x 33mm) across the handle of the sword. This design is available in a full match set of items. Order one piece or the whole set. 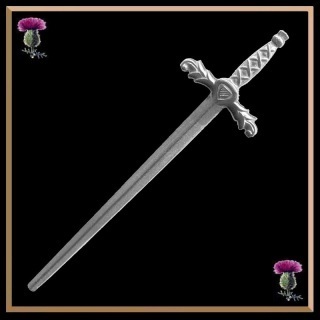 This beautiful raised relief high quality lead free pewter design is available in a full match set of items. Order one piece or the whole set. Great for a wedding for the groomsman. An excellent matching set! This Celtic interlace design is divided four quadrants. The directions of the compass representing the world and also representing the four elements; earth, air, fire and water. The circular disk is mounted on a pewter kilt pin measuring 3-7/8" (99mm) and is 1-5/16” (34mm). The overall interlace is the symbol of everlasting life or love. A nice connection for lovers or newly weds. 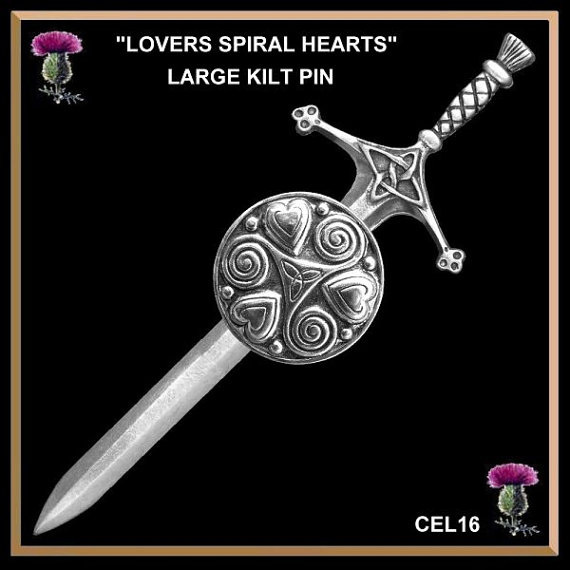 This lovely kilt pin features our popular Celtic disk, a truly unique and meaningful design from the Art Nouveau period. A seemingly simple design with much complicated meaning buried within! The Celts were noted for there use of threes. The center of this piece has a Triquetra or Trinity knot entwined in an interlocking with three, there are three hearts and the central spiral design has three arms. This central spiral design is referred to as a triskele. All of these elements are united together within a circle, the pendant itself, an ancient and universal symbol of unity, wholeness, infinity, the goddess, and female power. 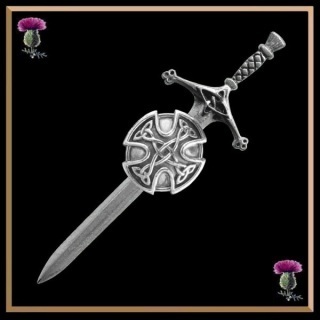 The overall length is 3-7/8” (99mm) and is 1-5/16” (34mm) across the handle of the sword while the Celtic disk measures 7/8" (22.5 mm). Great for a wedding as gifts for the groomsman or bridesmaids. 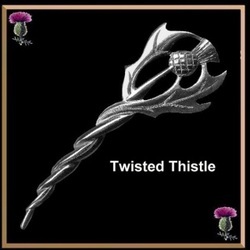 "Twisted thistle" solid sterling silver kilt pin. This design is one of the famous Iona Galleys designs that were made on the Holy Isle of Iona by Alexander Ritchie and his apprentices. This beautiful raised relief design is available in a full matched set of items. 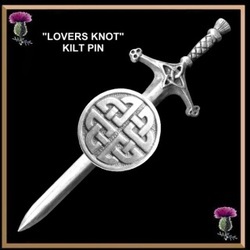 This kilt pin design is available in both pewter and sterling silver. This design is available in both pewter and sterling silver. 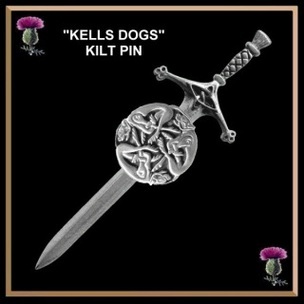 This lovely detailed kilt pin is fashioned in the design of a traditional Scottish Sgian Dubh. It is wonderfully designed with a Celtic interlace pattern and an interesting basket weave handle. It is topped with an amethyst paste stone. A perfect way to display your Scottish heritage. 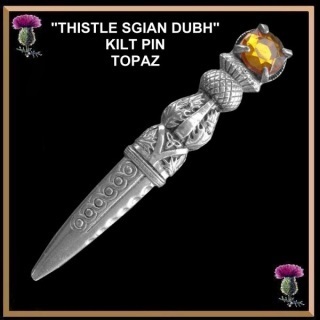 Our sgian dubh thistle kilt pin measures 4" in length by 5/8" in width (101mm x 17mm). 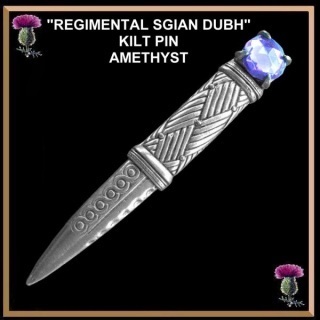 This lovely detailed kilt pin is fashioned in the design of a traditional Scottish Sgian Dubh. It is wonderfully created with Celtic interlace and the Scottish thistle as it's handle. It is topped with an amethyst paste stone. 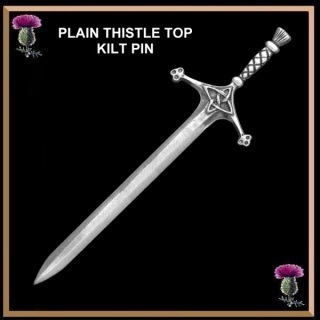 Our sgian dubh thistle kilt pin is a perfect way to display your Scottish heritage. Our pewter sgian dubh thistle kilt pin measures 4" in length by 5/8" in width (101mm x 17mm).